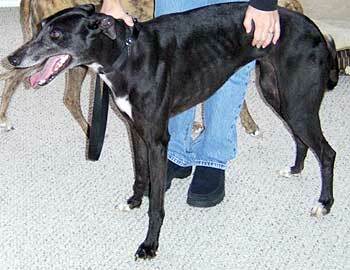 Savvy ran as Sav's Husker in Massachusetts for all 76 races of her career. She was born July 27, 2003, so she will be 4 years old this summer. Her dam is Eri Hiranuma, and her sire is Craigie Glen, whose grand sire is the famous Molotov and grand dam is of the Oshkosh lineage. This pretty girl came to GALT by way of the Easter delivery from Harlingen. Savvy is cat trainable and looking for a loving forever home for her much-deserved retirement. 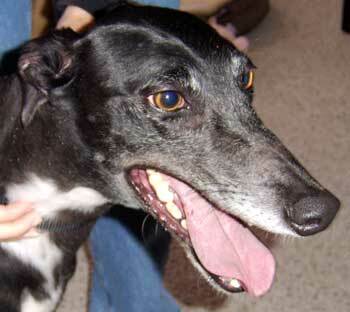 Savvy is a petite black beauty of a Greyhound. She has a white-patch chest and white-tipped toes and a non-stop wagging tail. Another of her fascinating traits is her ability to transform herself into a Doberman by raising her ears straight up at whatever interesting noise she hears. Truly a beautiful dog, she has a very loving demeanor and is always quick to come find out what's going on with the family. She is housetrained and crate trained and likes to spend some time soaking up rays in the backyard if the weather is nice! But, like most, she prefers to be inside resting on her bed or at least in whatever room you're working in. She is still learning counter-surfing is not an option, but after being reprimanded, will still hang around as if to say, "I just want to help where I can!" Savvy came to us without ever using stairs before, and with a little encouragement from Libby (our Greyhound), she figured it out and has gained all the confidence she needed. She's now a "stair-master" and has no hesitation going up and down when she feels the urge to follow her interests! Savvy enjoys the kids (elementary age here) and loves bounding around with them in the backyard. She has enough energy to keep up with them, but also enjoys the cuddling and belly-rubbies when it's time to chill out. Our cat, Bonnie, who is a Greyhound fan herself, gets along great with Savvy and the two do the occasional sniff sniff, but are very respectful of each other's space. Savvy is cat tolerant and except for the occasional ear-raising to see where Bonnie is going next, she shows no interest. Savvy is no doubt ready for her forever home and will be a Greyt addition to a family with children, cats, or whatever the situation may be.